Caverion is among Europe’s leading providers of technical solutions for buildings and industries. Our market position remained strong in 2017. The European market for technical solutions for buildings and industries is very fragmented. Most players in the field are smaller companies with a limited range of services. The fragmented market provides opportunities for growth. Technical maintenance is typically a very local or regional business and it is the most competitive of our businesses, mainly due to very low barriers of entry. To react to competition, Caverion launched to the market a new service concept ServiFlex+ for preventive maintenance. It brings together both remote monitoring and different service levels as a competitive package. 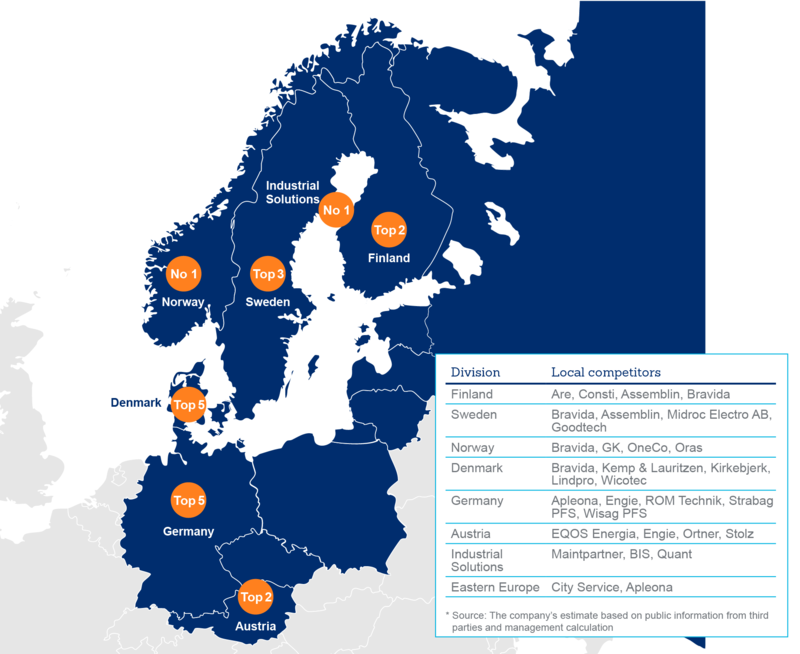 In 2017, we ranked among the five largest players in all of our largest operating countries: Finland, Sweden, Norway, Denmark, Germany and Austria. Additionally, Caverion is the leading industrial solutions company in Finland. The largest industrial client segments are the forest industry and the energy sector. Germany was clearly our largest addressable market in 2017. Therefore, based on the size of the market alone, there is large growth potential in Germany. The Projects market is expected to remain on a good level. Good demand is expected to continue from both private and public sectors. However, price competition is expected to remain tight. Low interest rates and availability of financing are expected to support investments. The demand for Design & Build of Total Technical Solutions is expected to develop favourably in large and technically demanding projects. Requirements for increased energy efficiency, better indoor conditions and tightening environmental legislation will be significant factors supporting the positive market development. The underlying demand for Services is expected to remain strong. As technology in buildings increases, the need for new services and the demand for Life Cycle Solutions are expected to increase. Clients’ tendency towards focusing on their core operations continues to open opportunities for Caverion in terms of outsourced operations and maintenance especially for public authorities, industries and utilities. Our objective is to foster long-term client relationships with our competence and local presence. Long-term relationships with clients and a wide client base support the stability of cash flow. Caverion is not dependent on individual clients: in 2017, the three largest clients represented approximately 7% of our revenue and the ten largest less than 14%. In addition, different client groups in the private and public sectors and geographically extensive presence reduce our dependency on economic cycles.